17. (What Happened 2 Our) Love Affair? 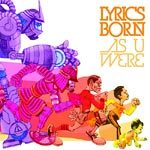 What happened to Lyrics Born? I wouldn't even consider this album hip hop... saw a live performance of this last night and was amazed that Lyrics Born would create an album like this. I was at the LA show for this new album and Chali 2na and Rakka rocked the mic, when Lyrics Born, the headliner, started playing this new album the crowd cleared out, I also bought the album, but this is just not the Lyrics Born that once was.